(Text automatically translated) In the historic village of Poggio, including streets paved with granite surrounded by chestnut trees, on a hill overlooking the Sea of ? ?Marciana Marina (5 km). It is a small studio nestled in the streets of the village, recently renovated with quality materials and equipped with every comfort, ideal for a couple, or even friends of friends. The studio is also a small gallery which has been converted into a bunk bed (mattress mt. 120) that allows if necessary to accommodate a person and a couple. This additional bedroom accommodation must, however, be considered an emergency bed use and is not recommended for long stays (eg. 2 couples) as the short distance of the bed from the ceiling (see photo) does not provide the same comfort of the master bedroom accommodation ( sofa bed 2 places). Even the closet-wardrobe is designed for the needs of a couple, so who intends to rent it for a stay in more than 2 people, even if possible, should take into account the above, the size of the studio (25 sqm) and the limited ability of the wardrobe. Concordo pienamente con tutti che hanno scritto prima di me. Poggio é un posto meravoglioso e incantevole. L'appartamento é piccolo,ma c'é tutto quello che serve. Il divanoletto non é comodissimo, ma abbiamo sicuramente dormito meglio che in altri posti sull'isola che sono piú trafficati e piú caldi. "Nel centro di questo di questo piccolo borgo antico c''è l''appartamento che si raggiunge facilmente in un minuto, vero, dalla strada dove si parcheggiano le auto. E'' molto grazioso, arredato in maniera raffinata, originale e accogliente, solo il divano a letto non è super confortevole. La finestra del soggiorno si apre su una strada che prosegue per pochi metri fino alla piazza dove si gusta un''ottima colazione con un panorama incredibile, la porta d''ingresso su un viottolo che si apre nella piazzetta con la fontana d''acqua di fonte. Da Poggio in pochi minuti di macchina si arriva a Marciana Marina e in circa venti minuti a Marina di Campo rendendosi un punto di partenza favoloso e comodo per girare ogni angolo dell''Elba occidentale." "L''appartement est très joli et les propriétaires d''une grande gentillesse et courtoisie. Le "monolocale" est meublé de façon simple mais avec beaucoup de goût et la cuisine est très bien équipée. Nous avons été bien accueillis et les propriétaires avaient tout organisé de façon très efficace. Notre séjour s''est très bien passé: Poggio est un village tranquille et frais, tout à fait charmant et loin des endroits les plus touristiques de l''île. Nous avons particulièrement aimé les bois qui entourent le village et l''atmosphère de Poggio. Pour ceux qui aiment la nature c''est un lieu très spécial!" "L''appartamento è molto carino e confortevole. L''unica pecca è il divano letto un pò scomodo"
"Poggio e` davvero incantevole! Questo appartamento e` davvero corrispondente alla descrizione del proprietario, piccolo ma ben curato, permette di vivere l''atmosfera delle piccole vie e piazze del paesino di collina. Vivamente consigliata l''auto per spostarsi nell''isola." "POGGIO,E UN PAESINO MOLTO CARINO LA GENTE E CORDIALE,LA CASA GODE DI UN'OTTIMA POSIZIONE,PICCOLA MA MOLTO CARINA TENUTA MOLTO BENE DAI PROPRIETARI,RISPECCHIA PERFETTAMENTE LA DESCRIZIONE DELL'ANNUNCIO"
(Text automatically translated) Poggio (alt. 350 m) is a very typical village consists of pedestrian streets and concentric with respect to the church located at the highest point. Famous for its spring waters (stock up on fresh water from the source Napoleon flowing from the fountain in the square! ), Poggio is a focal point from which you can easily reach Marciana Marina (multicolor town built around a quiet haven from which d &#39;summer day cruises depart on sailboats and where you can stroll among the stalls of the night market and vibrant), the clear blue sea of ??St. Andrew (10 km - photos), on the pebble beach of Pomonte (recommend for snorkeling explore the wreck of the ship Elviscot right on the beach), but also mountain trails (we are at the foot of the mountain huts, the highest peak of Elba from which you can admire a wonderful panorama.Between Poggio and Marciana, along a road surrounded by chestnut trees, is the starting point of the cable car.Another interesting itinerary for trekking for a ride in the car is the Monte Perone).In autumn Poggio holding the chestnut (October 25), festival that offers a wide range of products made with chestnuts and fruits of the forest, and during the winter season you can enjoy the spectacle of the raging sea or stroll through the woods in search of chestnuts and mushrooms or relax within its walls waiting for the sunset. (Text automatically translated) At Poggio are based what is considered by many the best restaurant on the island, "The Publius," a local historian who has a long tradition of fine dining able to associate with the delicate flavors of the mountains with the sea. 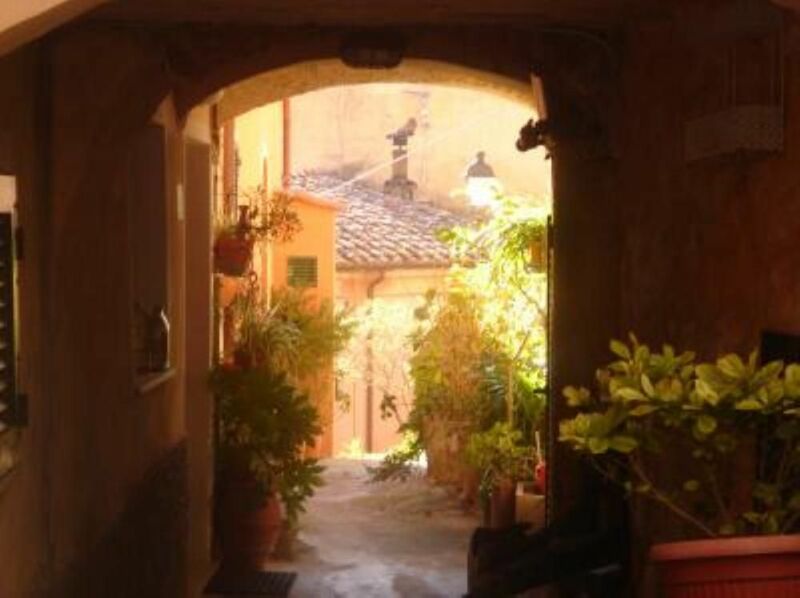 It has recently arisen trattoria "Sciamadda" able to offer traditional meals for the Genoese over the reception of the charming young owners. Here you can live un&#39;Elba different, breathe the mountain air looking out over the sea. It will not take long to make this small home become your "home away from home"